I will show you a number of ways to start. Choose the one you are most comfortable with. I will proceed with the template method which I feel to show the rest of the steps most clearly and unambiguously for those just learning. 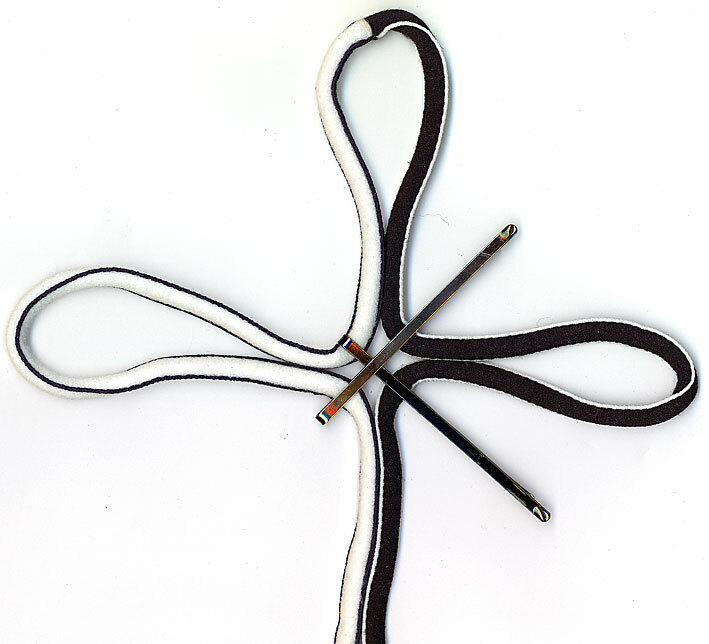 As you gain experience, you will likely use fewer and fewer tools in your knot tying, but as always it is up to you to choose what works for you. 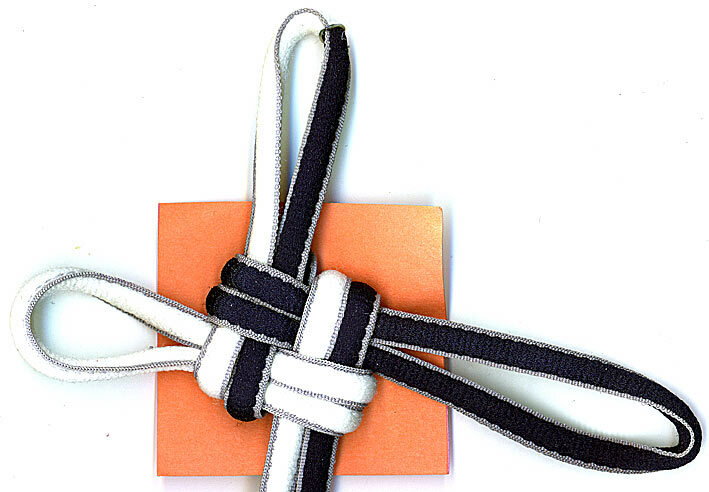 This is an unruly or freehand start for the good luck knot. 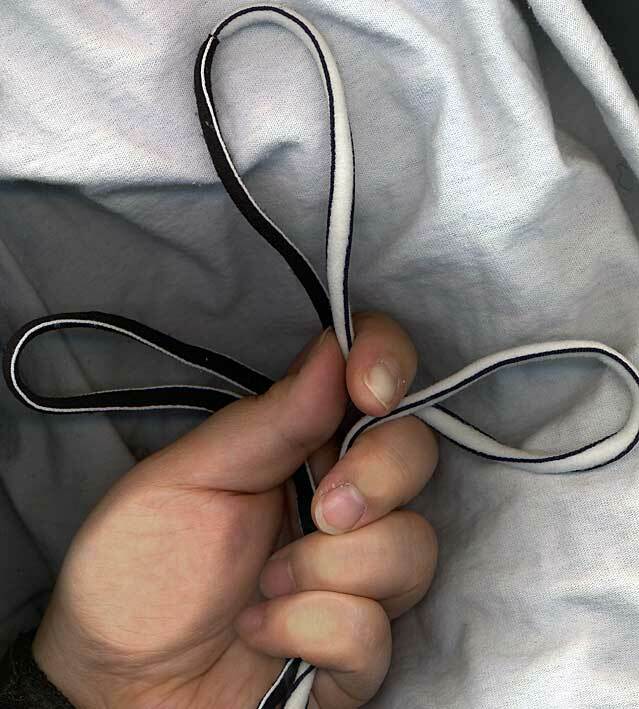 I usually use this method, however it requires a much longer working length than the others as long loops are easier to work with and less prone to disappearing as you tie. 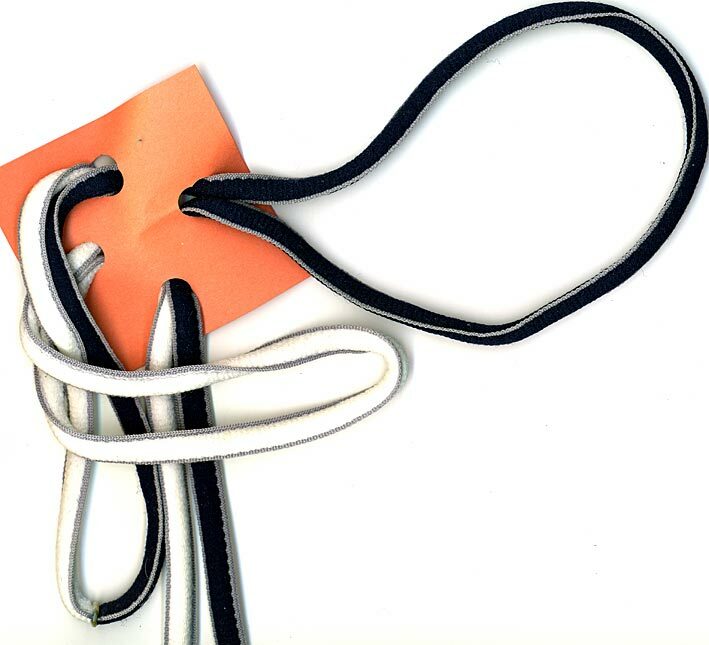 This is a pinned start for the good luck knot. 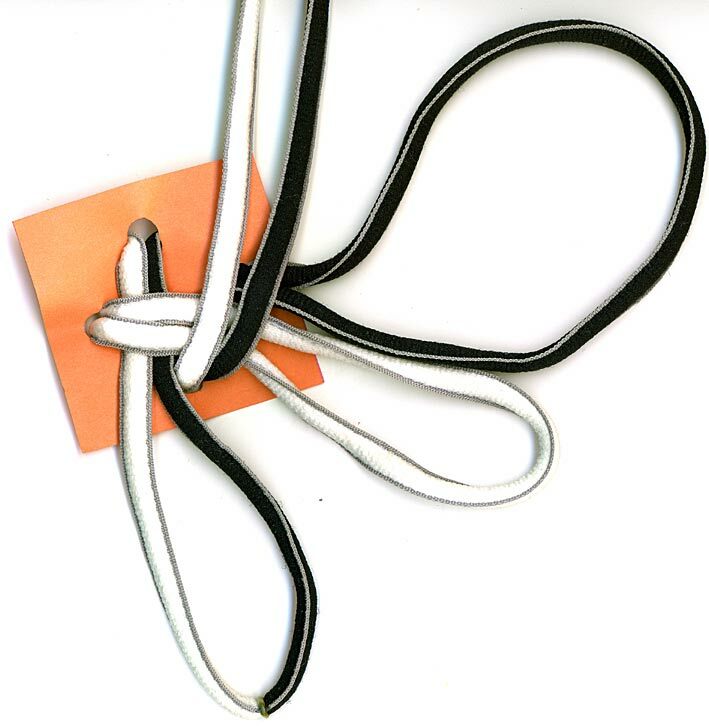 In case it is not clear from the illustration here, those are bobby pins or hair pins. Of course, you can use a pin board and straight pins (or thumb tacks or what have you). In that case, lay it out as above and pin away. You can, of course, tie the knot in hand. Your fingers really get in the way of seeing exactly where the string is, though, so it's a poor choice for illustrating the instructions. Take a paper template and punch four holes in it (see right, sorry for forgetting to take the picture until after it was torn off the knot...). 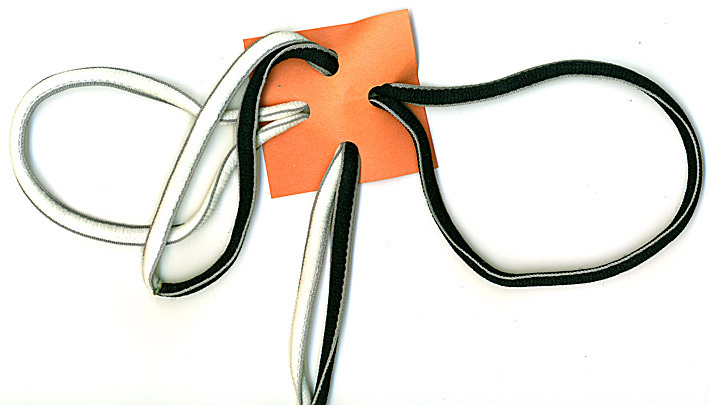 Pull the loose ends through one of the holes, and pull bights through each of the other holes (see far left, orange). 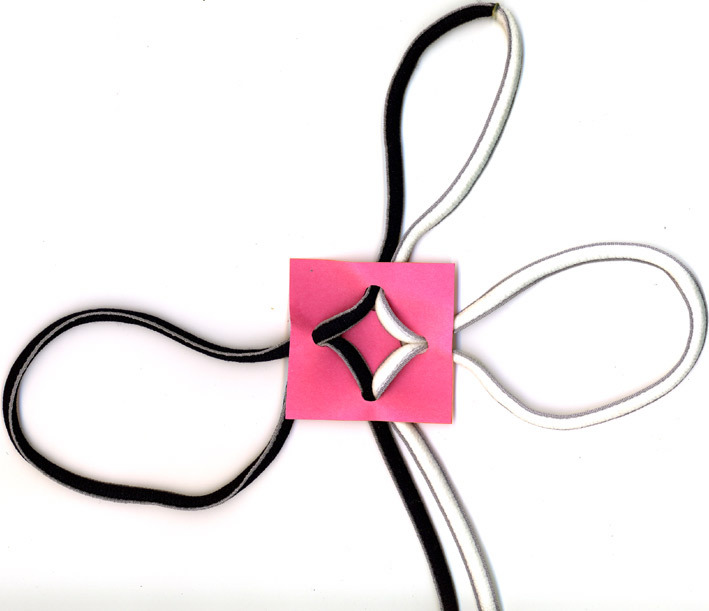 Pull the cord through the template until it is snug against the back of the template (see left, pink). 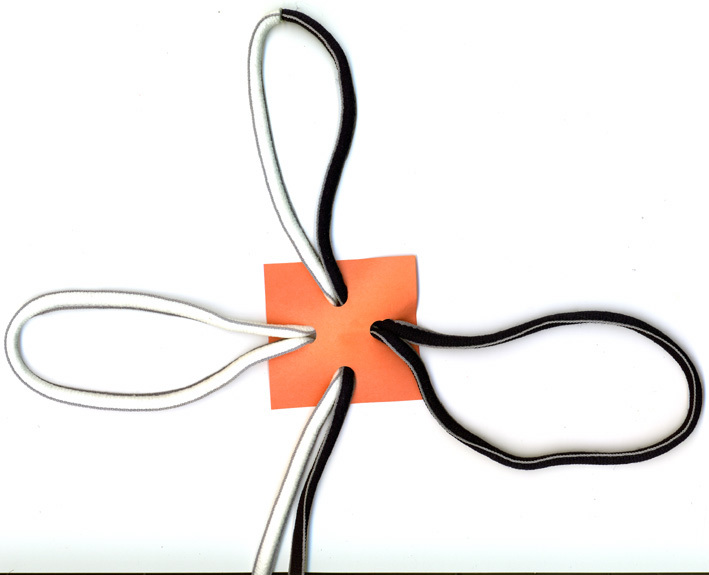 The cord you see on the back of the paper template will become the corner ears. 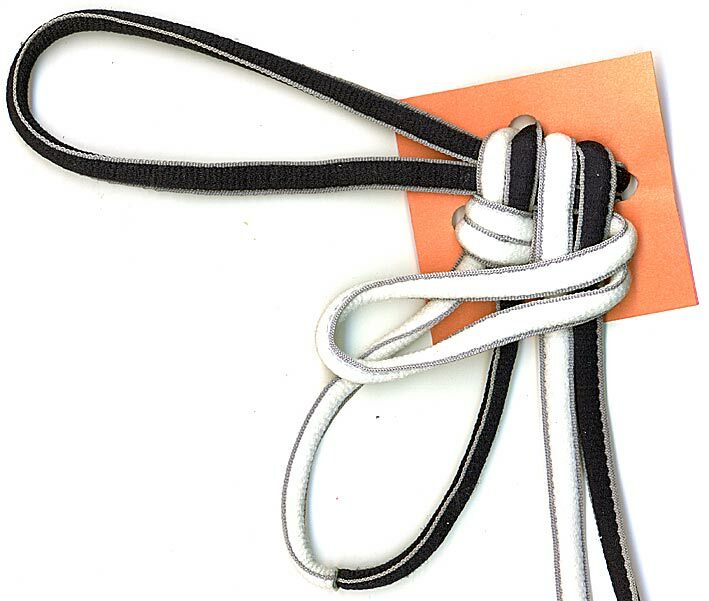 You are done the first series of steps, you have crowned the bottom layer of the knot. In the first layer, you did a counter clockwise crown, you are now beginning to do a clockwise crown for the top layer. 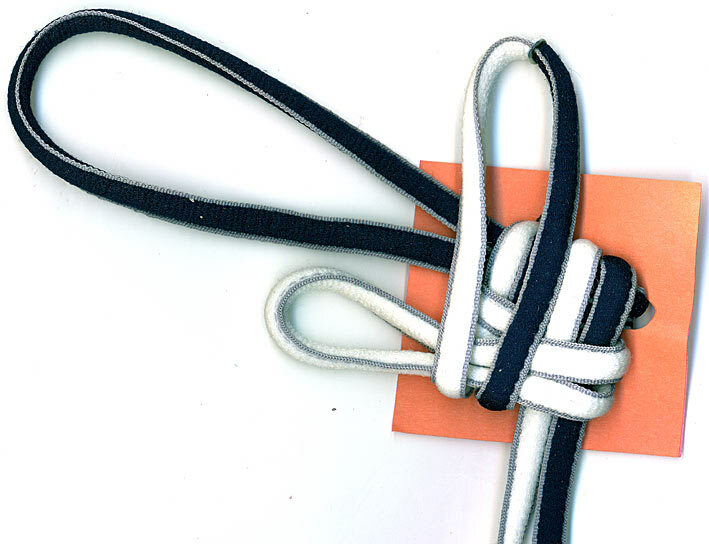 Of course, you can do two counter clockwise crowns but the knot is not as crisp if you do. What does that mean? Try it and find out! Fold the left bight over what was the bottom bight and under the top bight. All the tying steps are now done. Remove the paper template by tearing the paper. Adjust the ears as desired. 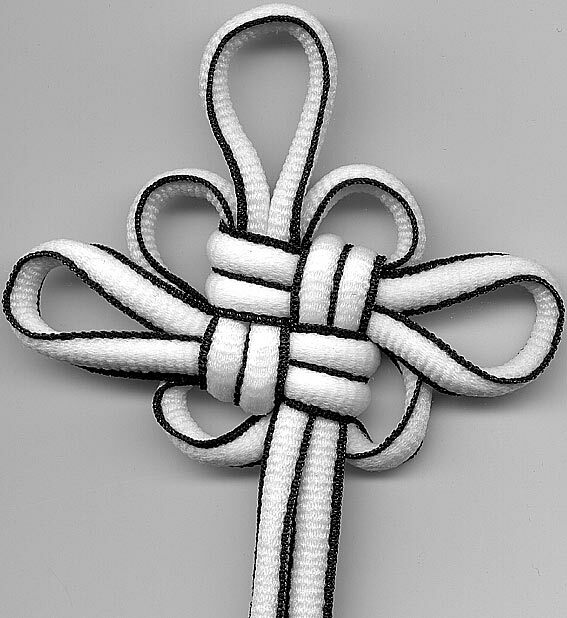 This is the traditional finished knot. 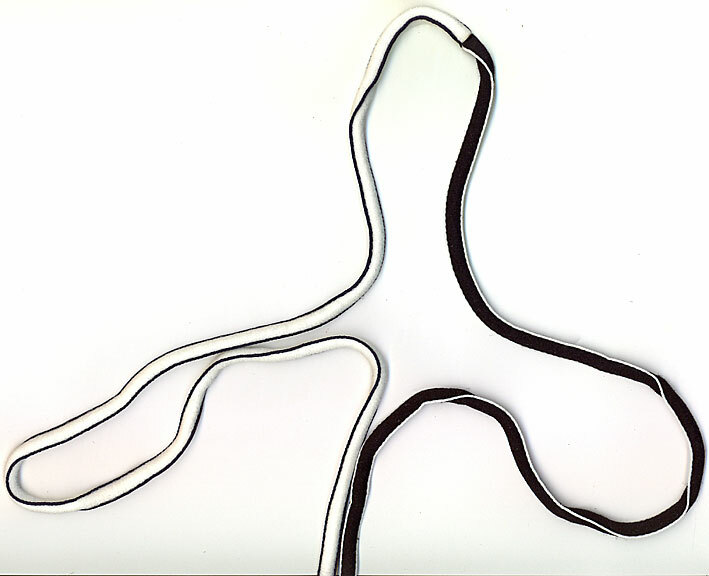 You can, of course, make the corner loops as big as the side loops or make them all small, etc. 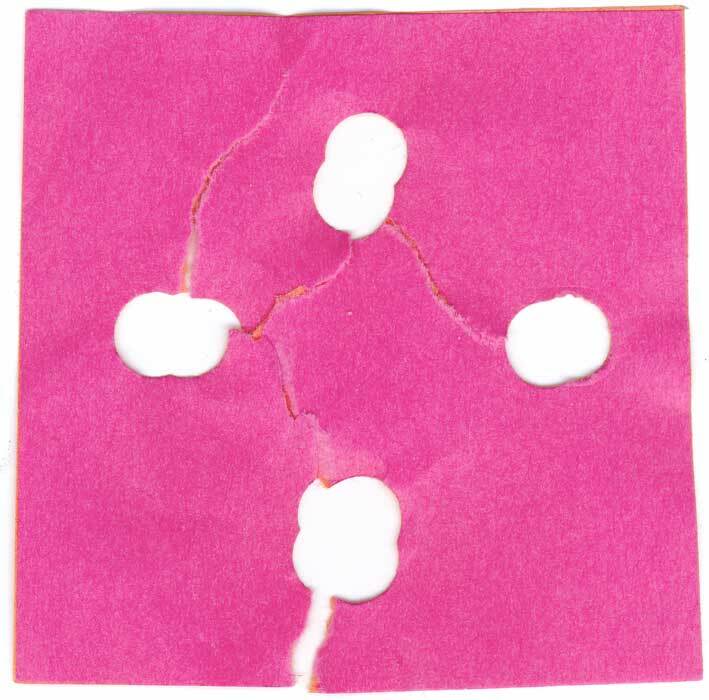 Just watch out for making the side loops to be too small nubs as they could pop out and the knot could fall apart. When I start crowning, I naturally start in the counter clockwise direction. 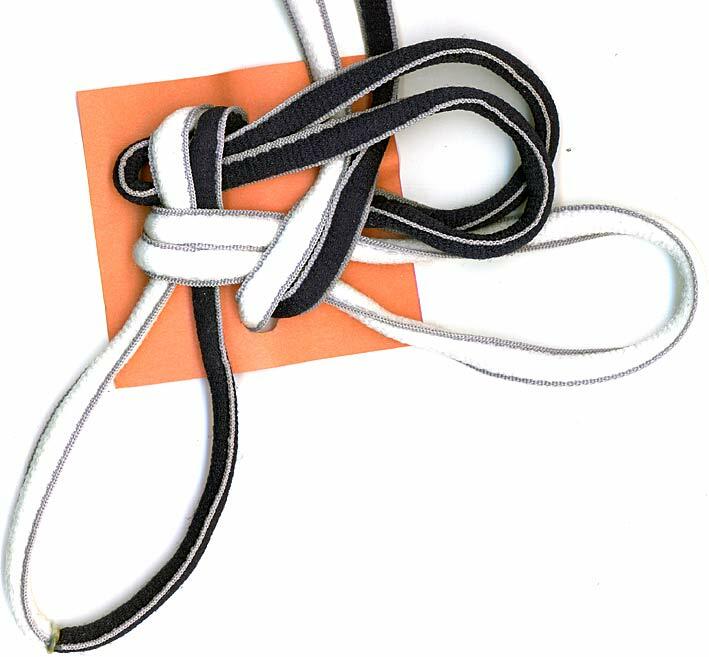 If your natural direction is clockwise, no reason you can't do that, but you'll still have to reverse for the second layer if you want a crisp knot. 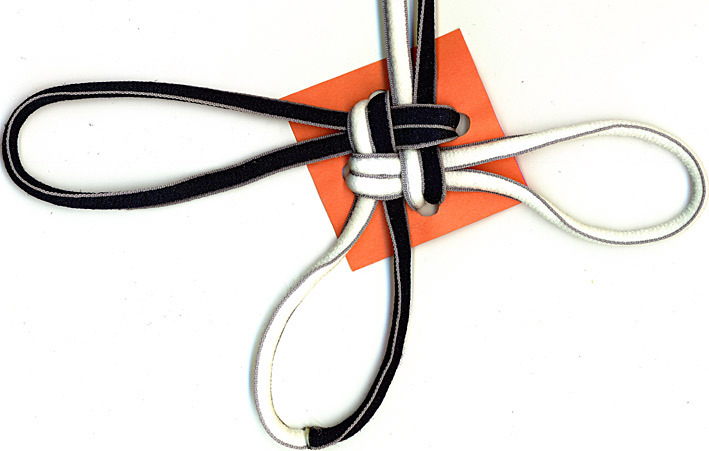 For a side by side comparison, the leftmost knot is the standard good luck knot with the crowning directions reversed between layers. 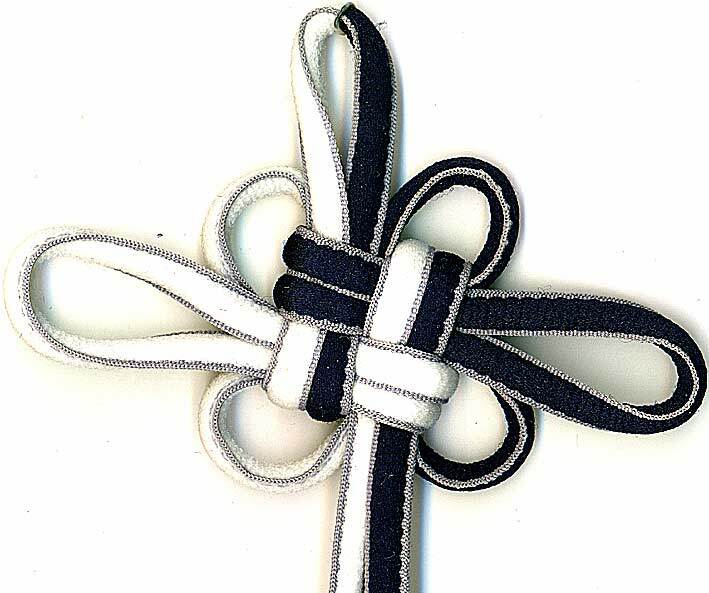 The near left knot is the good luck with the top layer crowned in the same direction as the bottom layer, the chrysanthemum knot. A note about the name: long and long ago I had a discussion with a fellow knotter how in the Japanese books he was studying, the crowning direction was the same with both layers whereas in the Chinese books, the crowning direction reversed between layers. 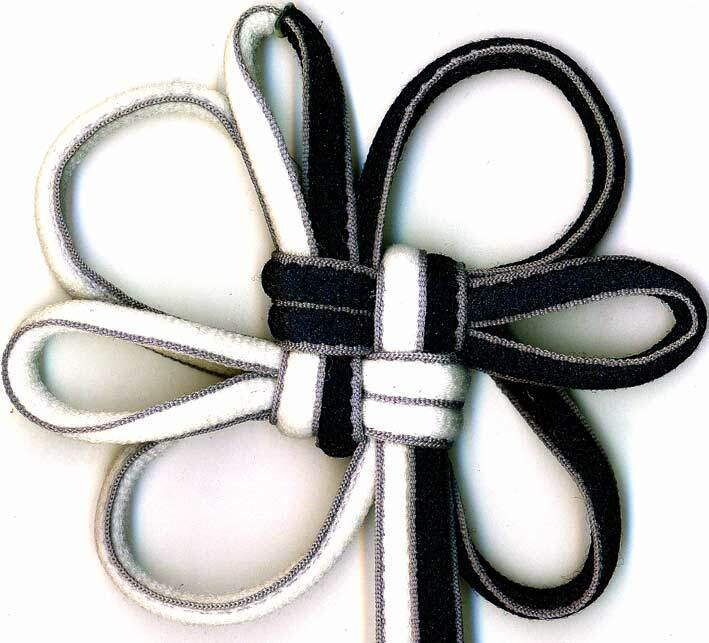 Since the Japanese (and Korean) name translates as chrysanthemum and since the mild change (a) makes for a less crisp knot and (b) the knot hangs slightly differently, naming this slight variation the chrysanthemum knot seemed like a good idea at the time. 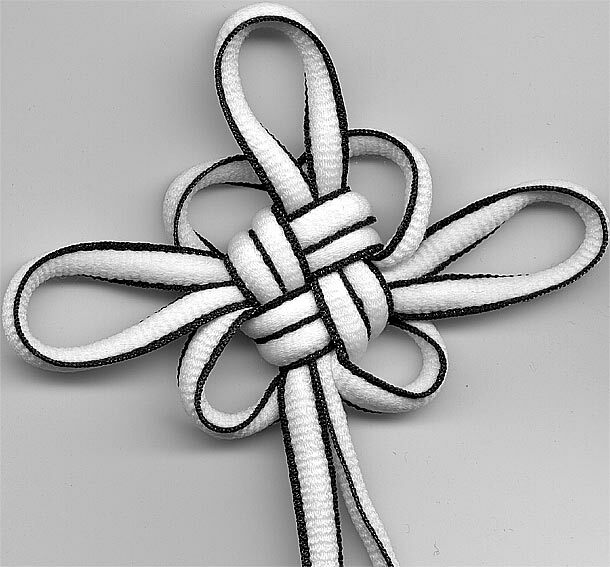 Now that I know the Koreans tie their analogue knot same way as the Chinese do, but call their mystic/pan chang knot the chrysanthemum knot... I suppose one could call it the Japanese chrysanthemum... or the clock counter double crown...?? 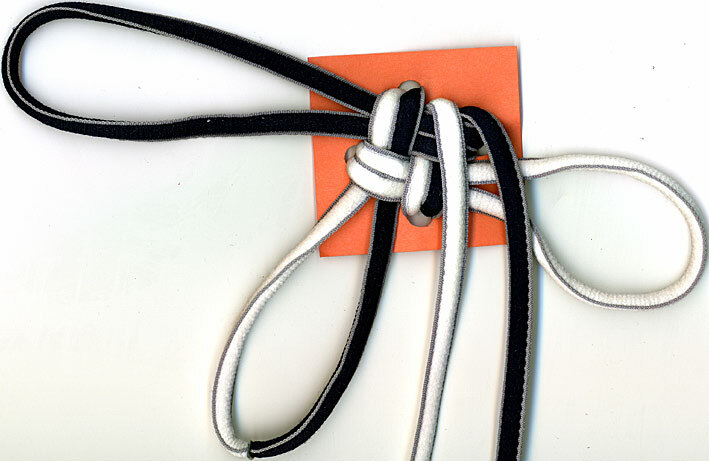 First I need to survey all my Japanese knotting books and see if they all agree on directions and go from there.